Can’t believe that I’ve spend the weekend watching the Matrix Trilogy. 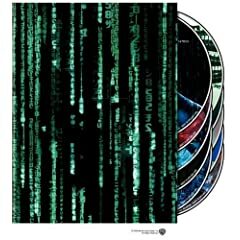 Back in those days when “The Matrix” was released in 1999, and followed by “Matrix Reloaded” and “Matrix Revolution” both in 2003, apart from enjoying the action, CG and FX, I have limited clue to knowing exactly clear or what was really happening behind the story. Fast forward 4 years to December 2007, thanks to DVDs from my friend, I’m watching the whole trilogy in a go. It was really great fun and brought up some good memories and questions worth asking and answers worth knowing. It was certainly and definately one of the greatest movie ever created, period. And thanks to Wikipedia, Google (or whatever search engine you like) and the ever expanding internet, you can practically read lots of interesting readings about the movie. I’ve spent at least another 3-4 hours browsing around the web reading reviews, understanding the matrix, quotes, plots, charaters, reading viewers comments and findinng answers. I think the greatest enjoyment of the trilogy was that it created more questions to be asked rather than answers (although there were some answers given by Morpheus, Oracle, Architect, Keymaker etc, but they were simply not enough!). It entice you to think rather than walk away from a movie and take it just as a pure entertainment. Some people enjoy watching this kind of movie while others don’t, it all depends. Just like what Neo found out in Matrix Reloaded while talking to “The Arhitect”: “Choice, the problem is choice.“. As in my case, I’ve made the choice of watching it, my emotions tell me that I like it, and my logical sense of searching for answers wants me to dig more for answers. Maybe I have just a few more active brain cells to burn in the weekend, that’s all. Go watch it again and see what you will come up with this time. I’m sure your brain have grown (hopefully!) and you might just see things a bit different this time.